There’s nothing worse than looking over the damage to your motorcycle after dropping it in a crash, but for riders lucky enough to slink away not too worse for wear it can sometimes be a cloud with a silver lining as it opens up the door to a whole new world of custom opportunities. This is the situation our customer Mixy found himself in after coming off his Triumph earlier in the year, with his pride only slightly bruised he came to Gasoline Motor Co to rebuild his motorcycle bigger and badder with a next level vision. 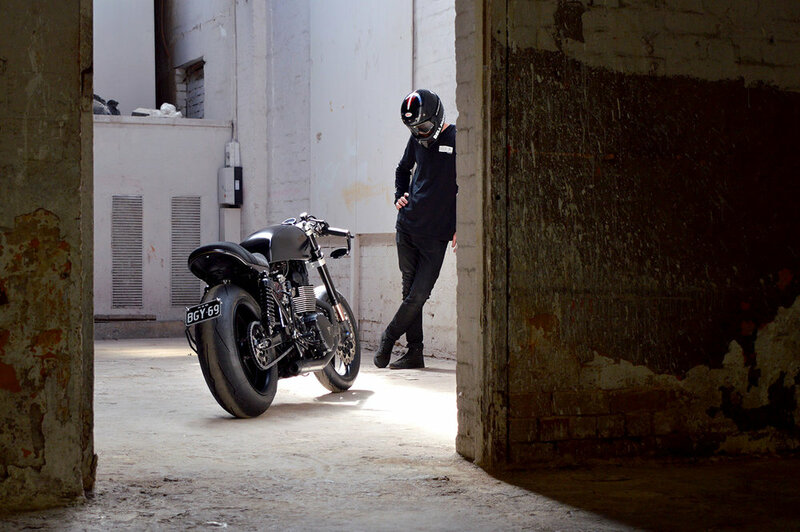 When his 2014 Triumph arrived at Gasoline Motor Co. in Sydney it was in shabby, but repairable, shape and wasn’t looking too pretty - the tank was dented, the engine cover was scratched, the exhaust was practically hanging off the rails and the motorcycle was riddled with issues. Mixy had done some mild custom modifications to the bike originally, but after meeting with the Gasoline team his plans for the rebuild grew significantly and this monster build began to take it’s dark shape. 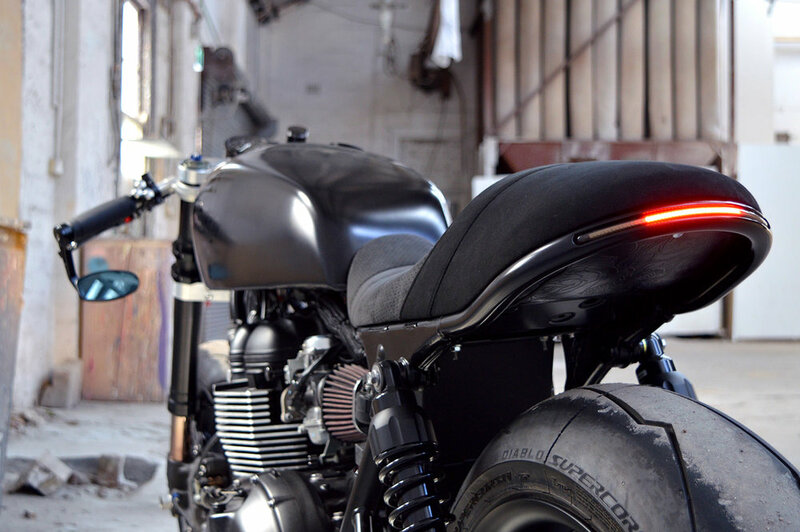 One of the biggest departures from the classic British donor is the tank, custom fabricated in aluminium to emulate the lines of the perennial favourite Yamaha SR tank and finished in Gasoline’s choice of a deep satin black. To complete the blackened theme gloss black racing stripe decals were added along with a vintage rendition of the well known Triumph logo based on the company’s look from the 30s. The wheels are US made Canyon TTs - a tribute to the Bonneville SE’s billet cut style, with some Pirelli Diablo Supercorsa rubbers sitting on them, giving the whole build a much more sporty vibe. The Canyon TTs are the first billet twin disc rim, designed specifically for the new ThruxtonR with wave discs from Galfer Braking, while the rear is a massive 190 with offset sprockets for that extra fat, low slung appearance. The front end was also swapped out for that of a Suzuki GSXR assembly with upside down forks, which meant that the front wheel had to be custom fit, by way of a custom axle and spacers. All of it coming together with a cleverly designed CNC made triple clamp. The racing vibe was further continued with the shift from mid to rear sets, combined with the low profile clip on bars that give the rider the ability to sink down into the bike when the need for speed takes over. The triple clamp was designed to snugly accommodate the Motogadget Classic speedo, in black of course, to go with the M-Lock keyless operation, keeping it as modern and cutting edge as possible. Even the switch blocks provided by Purpose Built Moto are sleek and contemporary, and among some of the cleanest triple push-button style switches on the market. The subframe was chopped and simplified to house an all new seat pan that was hand moulded by our head tech, utilising his newly discovered talent for working with fibreglass. The seat itself was hand made locally by Badarse Trim Co. using a suitably ashen suede, adding another dimension to the many tones of black throughout the build. Set into the rear of the frame is an integrated LED tail and indicator light, sitting flush along the lines of the seat, while the front indicators from Kellermann are some of the smallest LED’s you’ll ever find, but still bright enough to cut through the darkness. The headlight is one of the few splashes of colour amongst the blackness, the bright yellow light bleeding through its black grill like the flames from a raging furnace. 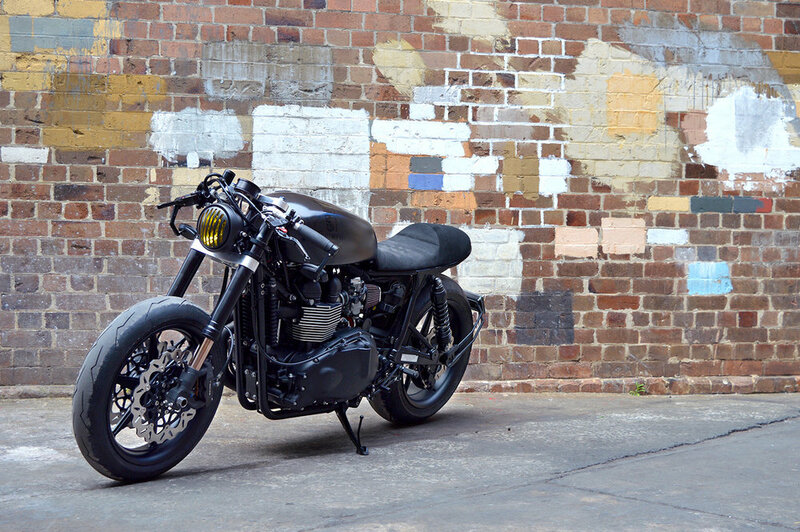 When Mixy brought in his battered Triumph Gasoline saw an opportunity to not just rebuild his bike bigger and better, but to shape it into something that could satiate all his darkest desires - a dark and modern cafe racer, that looked just as at home riding through the streets at night, but had a mean racing spirit lurking inside, just waiting to be unleashed. Massive shout out to The Commune for the awesome shoot location, thanks guys! 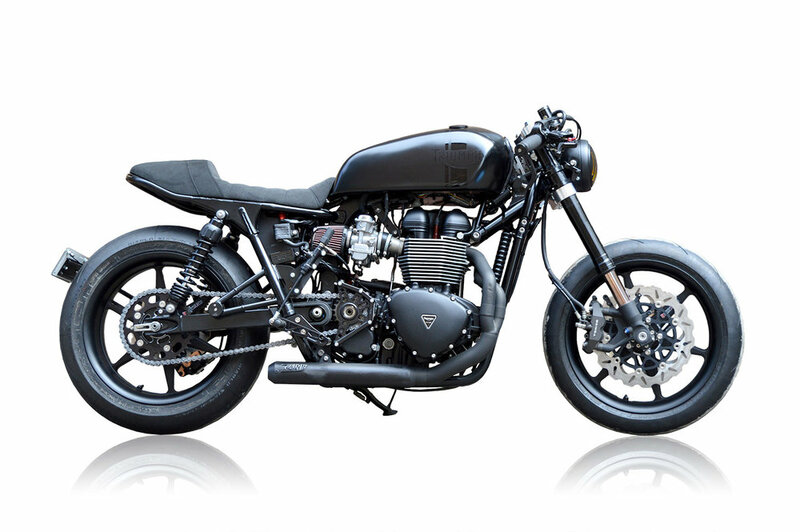 If you have an idea for your very own custom motorcycle Gasoline Motor Co. can help you make it a reality.